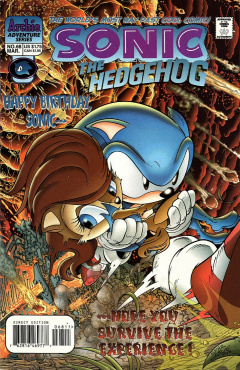 Sonic the Hedgehog 68 is the sixty-eighth issue of the Sonic the Hedgehog comic. This issue features two stories, the main sixteen-page story, titled "Surprise", and the six page back-up story, titled "Tales Of The Freedom Fighters - Part II: Survival Of The Fittest". In a three-hour tangent zone sits Knothole Village, existing this way because of the ambitions of the late villain Dr. Robotnik. Under the trees are the Freedom Fighters, as well as the family of Sonic the Hedgehog, Uncle Chuck, Jules Hedgehog, and Bernadette Hedgehog. They are all concerned about their world-traversing companion, Sonic. It is his birthday, and they are hoping that he will be back home in Mobotropolis in time to celebrate it. In Mobotropolis, three cloaked figures roam the streets, observing that the denizens of the city seem to be preparing for someone's huge return celebration. The cloaked figures are none other than Sonic, Miles "Tails" Prower and Nate Morgan. Nate can hardly believe he's back in Mobotropolis after all these years, though adds that it looks scarcely like the city he'd all those years ago. Sonic is convinced that early word of their return has reached the city, and that the event the citizens are prepping for could only be his birthday party. High above in space - The Final Frontier - a set of small asteroids make a pass close to Mobius. Nearby, a mysterious satellite activates, a voice inside uttering "K-Sat Unit back online. Commencing system location of target. Target acquired, system locked and beginning activation... NOW." A beam erupts from the vessel, targeting the passing space rocks. Meanwhile, in the abandoned island outpost of West Robotropolis, Snively and his cohorts are hiding. They have brought with them from prison the crystallized forms of Kodos and Arachnis, and are wondering what they should do next. Nack the Weasel wants to sneak into Mobotropolis and take it over, while Sargent Simian desires a more direct attack. A hawk wants an aerial attack. They arguing descends to name-calling, while Snively wonders to himself whether he's gotten in over his head trying to lead this rough-ian bunch. He makes a meek attempt to break up the fighting, when suddenly Kodos and Arachnis de-crystalize, declaring their return to life with a swing of Kodos' axe. Back in Knothole Village, the Freedom Fighters prepare to return to Mobotropolis. Bunnie Rabbot declares how pleased she is with this mini vacation in Knothole. Princess Sally seconds that notion. Nicole, Sally's sentient computer companion, interjects with an urgent transmission from Sally's father King Max. He's has been trying to contact them for a two days now. He requests they return at once to catch a citywide celebration, and "Honor someone from your past who has finally returned after some time away!" A statement in which all the Freedom Fighters assume to mean that Sonic has come home. They run home in a rush. Back inside the city, a still-cloaked Nate Morgan is amazed by how popular Sonic seems to be. He also assumes the preparations are for Sonic. Sonic jokes that he ought to check out Sand Blast City, where he's really "popular". Tails take off in a hover, to which Sonic promptly pulls him back down, not wanting to blow their cover yet. Nearby, the elderly guardian Rosie notices Tails' brief flight, and gives chase. Just as Sonic and Tails think the jig is up, someone looks up into the sky and screams! Rocks are falling from the sky! Everyone is in danger! Instinctively Sonic and Tails spring into action. So do the rest of the Freedom Fighters not too far away. Dulcy the Dragon blows a few up with her fire breath, while Bunnie escorts some children to safety in her arms. Sally asks Nicole for an analysis, as Nicole tells her that a group of asteroids were scheduled to pass close to Mobius, but not close enough to be caught in the planet's gravity. Sally states that they indeed have themselves a mystery... Just as she sees a blue figure speed by her. She shouts out to Sonic, who notices her, and sees that she's straight in the path of a falling rock! He leaps to her rescue in the nick of time, and the crisis passes. All the Freedom Fighters are re-united, and Nate Morgan takes the opportunity to introduce himself to the team. Sally asks Sonic whether her father is okay... He had told them of Sonic's return. Sonic interjects that he hasn't even seen her dad, and is surprised that he'd even know they were back. The leads to the assumption that the King must have been speaking of someone else, and they head to the palace to find out who. At the palace, the King is relieved to see his daughter unharmed by the day's disaster. Sally gives thanks, then adds that Sonic has returned with good news regarding the hunt for Ixis Naugus, to which the King interjects, saying that right now they have "No time for such trivialities. We have important matters to attend to". Sally is confused as she looks across the room. The King introduces Prince Elias Acorn, Sally's long-lost brother. Geoffrey St. John's secret mission was to find him and return him home, and he succeeded. Geoffrey then takes a moment to uncloak Nate Morgan, believing him to be an assassin sent by the Overlanders. King Acorn promptly instructs him to stand down, for this old man was once the greatest ally the Kingdom has ever known. Just as it appears that Sonic will go by without a birthday party, he's back home, where all his friends and family wish him a happy birthday. The Wolf Pack's raft docks. They deflate it and prepare to press forward in their journey to find other surviving members of their clan. As they wander a seemingly abandoned city they see movement in the shadows. They give chase and find a pair of young Overlander girls. The girls, named Aerial and Athena, are all alone, barely surviving. Lupe contemplates what to do with the little girls, and where to go next. This is the first appearance of Elias Acorn in the Sonic comics. This birthday is Sonic's sixteenth. He would celebrate his seventeenth in Sonic #160.